The Furutech GTX-D R is the finest AC receptacle made! Through a number of listening tests, we hear no improvement with the NCR, so save yourself some money while they last! After all, this model also has carbon and ceramic damping material in the body. The GTX-D R is constructed with Rhodium plated UP-OCC Copper. 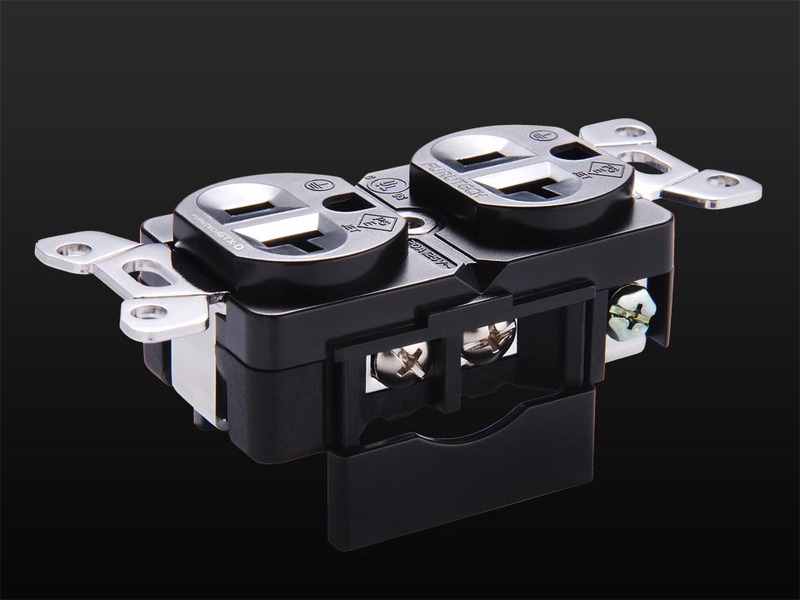 Ultra tight connections are made via patented contacts which are stainless steel-spring loaded. Yet, the contacts will not mar or scratch your plugs. Much of the outlet was designed to damp and shield. As with most Furutech products, it contains no magnetic parts and has been processed with Furutech's Super Cryogenic & Demagnetize treatment. These 20 Amp outlets accept 12-8AWG wire (spade connectors may be used). Total attention to detail and build quality extends right down to a specially designed patent-pending conductor pressure plate that increases contact area.